Dinosaurs and wins will roam your June days and nights when you make deposits of as little as $35 from Monday through Thursday! 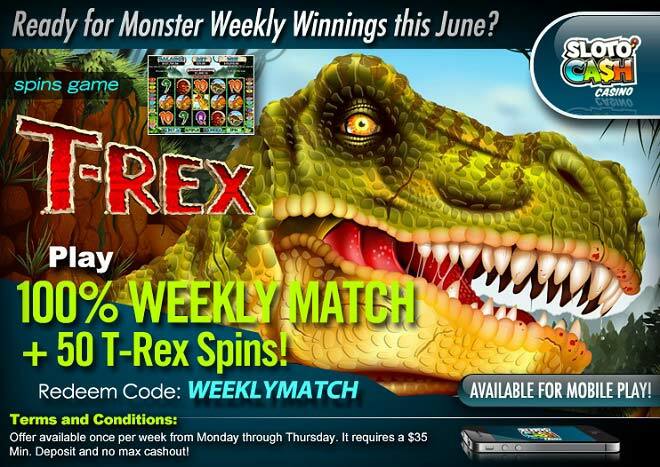 Huge and mighty riches will have you on the edge of your seat when you claim a 100% Match plus 50 T-Rex Free Spins! Two fantastic bonus features open the doors to more wins. Land three or more T-Rex eggs scattered anywhere on the reels and collect another 50 free spins. Land the T-Rex wild symbols and you’ll be doubling your wins right then and there! Travel to prehistoric times, spend some time with the king of dinosaurs and collect humongous wins when depositing as little as $35!